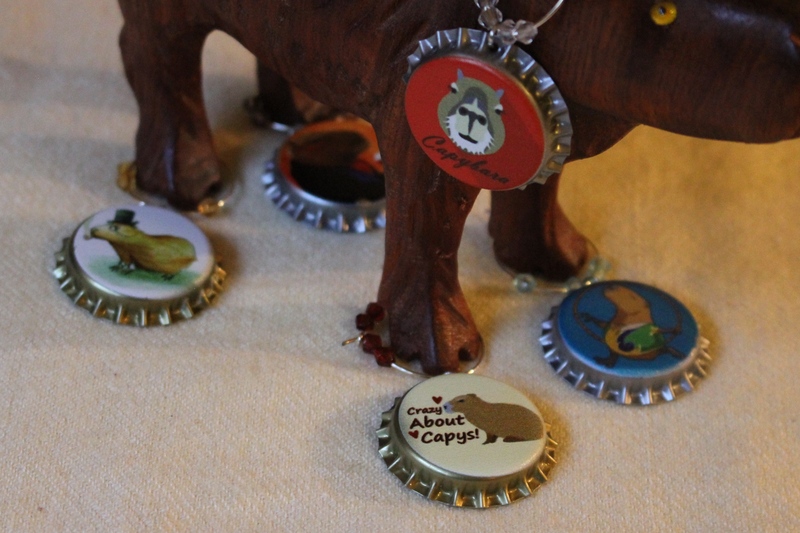 When I was in Arizona last June, I visited my friend Georgi, and saw all her capybaras and other silly assorted rodents. But what I really wanted to see was the Tucson Reptile Shop! It was kind of scary, but I took a million photos. While I am scrolling through my cute guinea pig photos, I scare myself half to death when I have to pass through the Zone of the Creepy Crawlies. So they have this incredible fossil tarantula casually hanging from the ceiling. It is 13 kazillion years old, but they still don’t trust it to be dead: you can see they have a camera strategically placed so they can watch it. Since it ripped the foot off of a customer last year, they have someone monitoring it all the time. The sign says “touch me!! !” because these are very life-like wind-up toys. That white one is a vinyl roach-shaped coin purse. This is actually a mechanical pencil. The “legs” push the lead out as you write. I got a whole bunch of these to sell at the Funny Farm gift shop. These had been collected the day before. 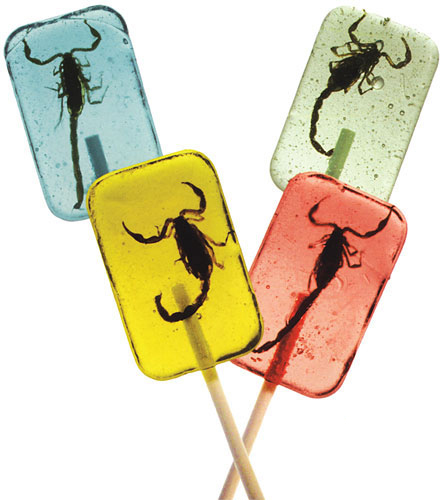 They sell thousands of live scorpions. There’s a back room with dozens of plastic boxes stacked up, all full of rubber scorpions. They’re quite realistic! The rubber is so jiggly they look like they’re moving. Usually these are made in China, but they didn’t have country of origin stickers on them anywhere. Seriously, they have thousands of live tarantulas for sale. Most of the stacked up boxes have gigantic plush tarantulas in individual soup containers. The lids are all broken. They should put them in baggies, like the rubber scorpions. Or maybe just put them out on a shelf so you can see them. Yeah, and every time I turned around I was very careful not to bump anything. Every time I turned around, I would discover another box of scorpions. these are kind of medium sized, not quite as jiggly as the big ones. There were edible tarantulas, too! This was a batch of jello, ready for delivery to the assisted living facility next door. Instead of fruit, they drop a gummy tarantula in each cup. Baboons add a tropical tang to a typically flavorless dessert. Better here than in your shoe, I guess. Yeesh! Another box of rubber scorpions, but smaller. I bet they’re going to make lollipops out of these. They’re a good size for that. Hey look, they have a tarantula! This one looks a lot like Mary Ellen, a pet my second ex-husband named after his ex-girlfriend. I insisted that she be caged on the dresser in our bedroom, so I could check to make sure she was in there each night before I went to bed. When we separated, he left his pet behind for months and months and months. Might have been years, it was a long time ago. Anyway, I bought her crickets, changed out her water, and cleaned her cage nearly forever. She died a few weeks after he took her back and it made me sad. She was so pretty. Once I trusted her to stay put. You know the Walmart greeters? Well, the Tucson Reptile Shop has Currie, an Asian Water Monitor. He’s a bit of a showoff. 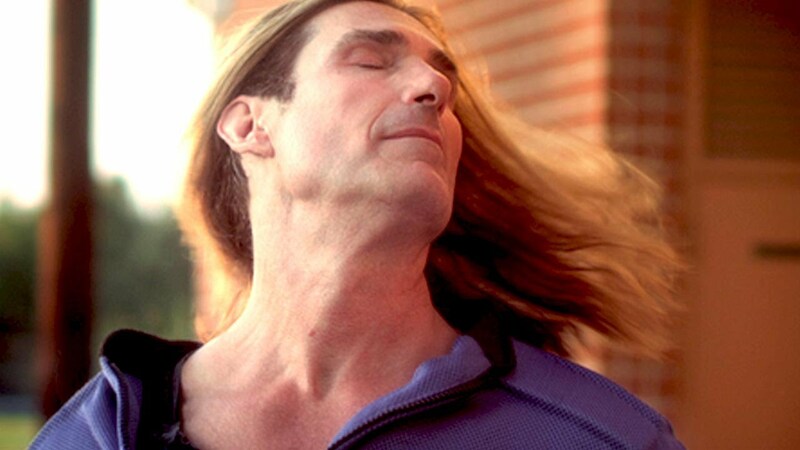 He needs a little Fabio wig and a fan to make his hair drift in the breeze. He’s good looking, and he knows it. You might want to scoot your chair back, just a bit. Georgi is holding him back. These big guys have been known to leap right out of computer monitors to swallow readers like you in one gulp! She’s really struggling with him, now! Let’s move along! I lean over to look in there . . .
Now we’re in a room with a dozen rolling racks, each one with half a dozen trays like this. What has she got in there? Pied Ball Python, though I admit this would be a scarier photo with the head showing. Yikes! It’s a rare headless snake, and it’s wrapping itself around Georgi’s arm! Wait, no, it’s slithering down her leg and it’s coming for me! Ah! Saved! I forgot she is a graduate of Hogwarts, Slytherin, of course. She just turned it into a tiny harmless little snake. Phew! So cute! Adorable, really, like a giraffe-snake. But venomous. I see. Maybe it’s time to leave . . .
Asian Water Monitor, this one less than a year old. If you want to learn more about bugs and stuff like this, check out Ken the Bug Guy. They sell all kinds of scary stuff. If you are in Tucson, you probably already know all about the Tucson Reptile Shop. If not, you should check it out. There’s a lot more to it than this!